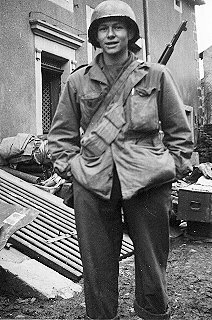 On national television, NBC news 20 or 21 Dec reported on Bob Bailey's action in March of 1945 where he was ambushed by germans along with Cpl Carl DeBoard and killed two of his attackers with his pistol. Capt Helbling and I wrote him up for a Silver Star, but at Corps headquarters it was reduced to a Bronze Star. Now, 63 years later, it has been reviewed , and he got the Silver Star. Mary Macnamara saw the broadcast, and called me. Bob Hahlen aka Small Buck is looking to get in contact with anyone from Company F 376 Infantry 94th Division. I live in Alliance Ohio 330-823-5632. Please call. I'd like to know if anyone who served in the 94th Division, 376th Regiment knew my father, George A. Toste. He was 21 years old in WW II and was a sergeant in "E" Company. He was from Pawtucket, Rhode Isand. He passed away in May 2000 and is buried in the R.I. Veterans Cemetery, Exeter, Rhode Island. It would be very appreciated if I could find out more about him, his unit, the trails and tribulations that he faced in WW II......He like so many of you veterans never talked about your hardships, but a son like me and others of my generation are very proud of our fathers and have a great need to know what happened. I am writing to learn if your organization has any information about Pvt. 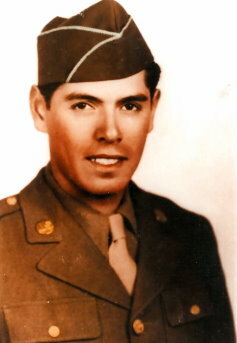 Manuel Hernandez who, as a member of the 94th Infantry Division, 376th Infantry Regiment, was killed crossing the Rhine River into Germany on March 22, 1945. In 1944, "Nay" Hernandez was the starting left fielder for the San Diego Padres baseball team of the Pacific Coast League. At that time, Nay was classified 4F because of a heart murmur. When the local draft board realized he was able to play professional baseball, Hernandez was drafted into the Army. He is survived by a son, Manuel "Baby Nay" Hernandez, who was 4 years old when he father left for the Army in 1944. From a family of 15 (5 male, 10 female), only sisters Toni (Antonia) and Tina (Valentina) remain alive. We recently attended a Veterans Day ceremony together at Chicano Park in San Diego. I was in Company E, 376th and would like to receive information on the division. I left on 26 January, 1944. Hi, I´m Harry H. Jungblut, I´m 78 years in age. I´m talking from my hometown Duesseldorf at the Rhine river, when the US-Army occupied this town very peacefully. In the time between May and June - I´ve turned just 15- my mother in age of 44 years was laying on the death-bed, when US-soldiers entered our house. When these guys entered the sleeping-room, seeing my critically-ill mother, they were very respectful and touched, while my mother was crying. The very friendly US-guys gave me the order to following them and they gave me a lot of food I´d never seen before. Specially one of these nice occupying- forces-soldiers I remember very very well. His Name was GEORGE MURPHY from the 94th. Now, 63 years later, I´m very interested to experienced something about these friendly men, I think, our sweet Lord, our god has sent him to us at that terrible time. Thank god internet makes it possible to contact you. It would be very delightful if you could tell me something about George Murphy. For me it´s a very lovely memory. All the best to all the friends, members of the 94. My father, Sgt. 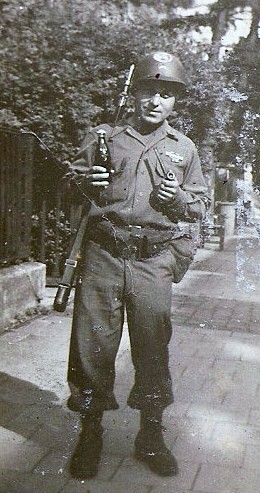 John Joseph Hunolt (Corporal most of the war) of Edina Missouri served in the 94th division, battle of the bulge, etc. He has been gone now for several years. He had some personal photos (original) of an event in Ohligs Germany, approximately 12 or 13 pictures, that showed bodies being dug up, identified, and reburied in front of the court house in Ohligs. Recently, in going through some of his belongings, we found these photos. We would appreciate any information about this event and are willing to share what we have/know. I am very excited to see the movie and see if it will shed more light on this time in dad's life as he was very careful to discuss it with us. My name is Gail Stephens-McHugh. My great uncle is Noah Stephens of the 94th infantry, 302 regiment, Company L, 3rd Squad, 2nd Platoon. Uncle Noah is 84 and still runs his company in Lavalette, WV. He ask me to see if I could locate a man named: Hilliary Dishotel? 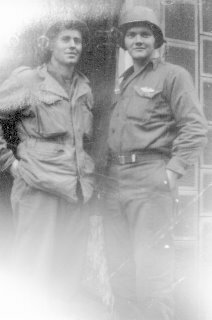 Hi, I am emailing because I am interested in finding out any information on my father ROBERT L. ROSENBERG, he was with the 94th infantry division during d-day and actually for 6 years from 1939-till February, 1946. If you can help me i would greatly appreciate it, thanks, Randy Rosenberg, also I am a Vietnam era veteran of the Big A 1st Army. I would also like to remember those who have fought and died for our freedom. I received this photo this morning from a friend. It is truly amazing. Found it amazing that this photo, taken so many years ago, actually still exists! And now someone has put it online for all of us to see. 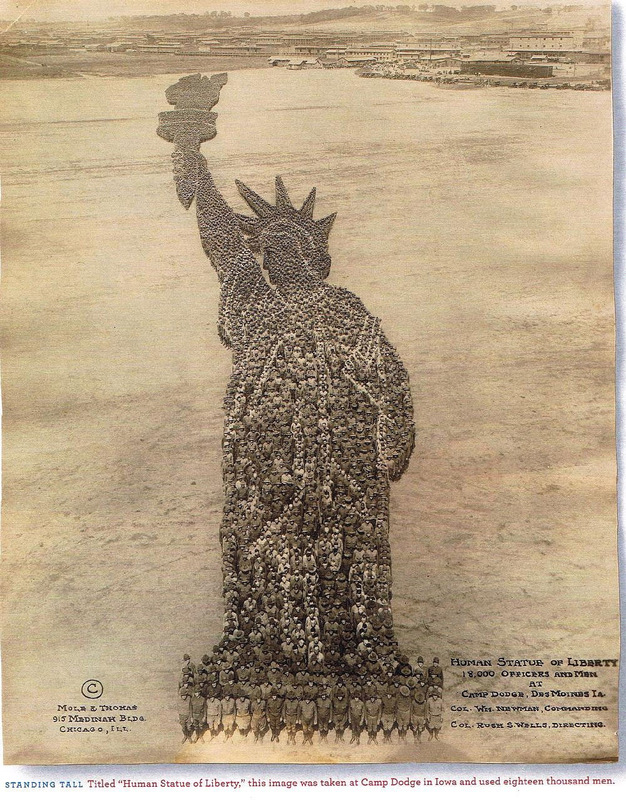 This INCREDIBLE picture was taken in 1918. Photo is of 18,000 men at Camp Dodge in Iowa preparing for the War. EIGHTEEN THOUSAND MEN !!!!! I am in search of a contact for my Father, Captain Reynolds who served in the 94th until being wounded in action in April of 1945 near Sinz Germany. He is trying to locate a Mr. Harry Lewies. Any information would be appreciated and I may be contacted at the numbers or email as shown in this message. dear mr helms, maybe you remember me from the past still on duty to search the 94th battlefields, but of course most areas are quite cleaned up now! Got a call from a german friend telling me that a silver ID bracelet was recently found near zerf Francis S. Turzak asn 36856452. My research found that he was kia on march 1st 1945 enlisted from michigan and was a sergeant in the 302nd regiment of the 94th division. He is buried in the ardennes military cemetary in belgium in plot B row 37 grave 43. Now my question is if any relatives could be found as this person is willing to handle this ID to the family of this GI. Thanks for any help and hope to hear from you soon. Alex - Guess what! My telephone call to MI produced a great result. A Denis Turrzat 3744 Mayfair St Dearborn, MI 48124 returned my message to say that he was the great nephew of Frank Turzak and would be delighted to receive the ID bracelet recently found near Zerf. He still has the flag that was used at Frank's burial in the Ardennes Cemetery. To facilitate things, why don't you send the bracelet directly to him and give him the name of your German friend in case he wants to contact him. Thanks again for your help in this matter. I could tell from talking with Denis that he really appreciated your effort. My father Dean "Chet" Perry served in the 94th Division - 301st Regiment. Perhaps Company G, but I am not certain. I am in possession of the pictures he took while in Europe (mostly France) and the names of some of his comrades are "Payne", "Hunnicutte", "McKean", "Hosler", "Dillion", "Folsom", "Farell", "Dosier", "Park", "Lookeby", "Kupuniuk". There are numerous photos of places and people. Today, America is rapidly saying goodbye to our "Greatest Generation" of citizens. The State of New Jersey is taking the initiative to honor and remember them by creating a memorial in Trenton across from the State House at Veterans Park. Fittingly, the theme for New Jersey's World War II Memorial is "Victory." The memorial will honor and pay tribute to the courage and the many sacrifices of the World War II Generation as it celebrates the greatest victory our country has ever known. My father "Manuel Brittain" served in the 94th Division - 302nd - M Company. He is searching for some of the men that he served with, one being Clarence Howard who was from Kentuckky and a Gunner with my father. If you know of any servicemen who served with my dad, please e-mail me. Thank you for your time. My name is Ephraim Smith and I am a retired professor of history in California. I have produced a three-part documentary - the first part (57 minutes) is "Power for the Parkinsons," which tells the story of the REA as seen through the experiences of the Bill and Hazel Parkinson family of St. Clairsville, Ohio. The second looks at the military contribution of three of the sons in World War II and Korea. A middle son, Tom R. Parkinson, was in the 301st Infantry (company G, I believe) and received the Silver Star and Purple Heart for actions in Sinz. The family does have the citation and in my documentary (The Parkinsons) which has not yet been released to PBS stations/cable, that citation is read by Walter Cronkite. Tom Parkinsons is also referenced twice in Tony Le Tissier's Patton's Pawns. I was also fortunate that the family had a few photos. If anyone knew Tom during his service with the 94th (he came back to Ohio and worked on the B&O railroad and he died ten years ago), I would appreciate hearing from you. For more information on the Parkinson family, see www.powerforparkinsons.com. 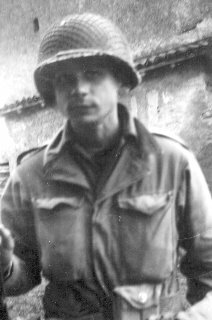 Since Tom was deceased long before my project started, Dr. David Leffer, who was with the 302nd (part of the landing and holding operation in France) and also at Sinz and later battles, appeared, at my request, in The Parkinsons and provides background information on the 94th and that battle. David is a very modest fellow and would not tell me at the time if he received any medals. I only learned recently (being persistent) that he had been awarded the Bronze Star. He provided a good deal of information on battlefield conditions and the engagements in which he was in, but I was only able to incorporate a small portion of what he said (I had to keep the focus on The Parkinson. ) If he does not object, I may post the other segments subsequently on my web site. I am not a military history specialist and I would like to say that I knew little about the 94th when I started this project. But if Dr. Leffler is is any way representative, you were an outstanding group of soldiers.. From what I have read in "Patton's Pawns," you were not given either sufficient supplies or credit by that general. I hope the short segment in my documentary adds a small corrective piece. 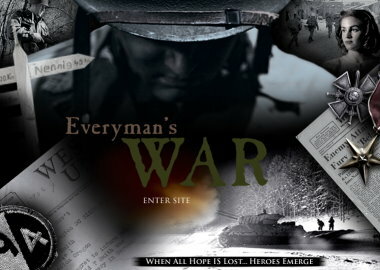 I am also looking foward to seeing Everyman's War when it comes out. If anyone from the 94th decides to buy "The Parkinsons" or the other two Parkinson DVDS (see the web site for details), do not purchase it on the web site as the Paypal set up will not allow me to give you a 20% discount because you were with the 94th. Instead send me an email at Ephraims@onemain.com and I will provide instructions, or send a check (with a note you were with the 94th or had a loved one with that Division or just simply write "94th" on the check) for one of the following: (A) for $19.96 ($24.95 minus 20%) plus $5 S/H for The Parkinsons (Total $24.96) ; or (B) $31.96 ($39.95 minus 20%) plus $5 S/H for that DVD and the preceding program "Power for the Parkinsons (showing on selected PBS stations) (Total $36.96); or (C) the three DVD combo set (which adds a 56 minute program of three 1939-1940 REA films featuring the Parkinsons) for $43.96 plus $5 shipping/handling ($54.95 minus 20%) for a total of $48.96. My name is Gary Bedingfield and I am a sports historian writing a book on baseball players who lost their lives during World War II. 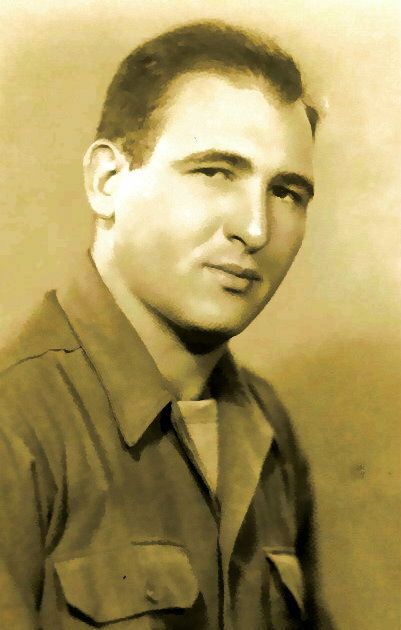 Manuel P Hernandez was an outfielder with the San Diego Padres of the Pacific Coast League before entering service with the Army in August 1944. 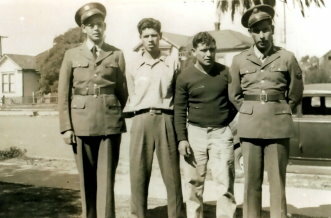 Hernandez arrived in Europe in January 1945 and was with the 376th Infantry Regiment. He was killed in action on March 22, 1945. If anyone can help with information relating to his death or time in service I would be very pleased to hear from you. Anyone have any stories or recounts of Ernest J Hinck PFC. If so please e-mail them to me at cam.thomas@cox.net. My Grandfather was in the 94th infantry, Company B, WWII P.O.W. His name is Pete Branham from Rusk County Texas and he is still living, although he is not doing very well at this time. He and the remaining Company B were taken captive January 1945 and held for 97 days. My great uncle Roy was a PFC in Battery A, 919th FA BN. He served in WWII from 05 Dec 1942 thru 07 Dec 1945. Battles and Campaigns: Northern France, Ardennes, Rhineland, Central Europe. Medals and Citations: Good Conduct Medal, Distinguished Unit Badge and Victory Medal. Other: European-African- Middle Eastern- Theatre Service Medal. American Theatre Service Medal. Two Overseas Service Bars. 14 Days lost under AW 107. Lapel Button Isssued Inact Service (ERC) FT, 28 Nov 42 to 04 Dec 1942. Departed for ETO (European Theatre of Operation), 06 Aug 1944. Arrived at ETO 11 Aug 1944. 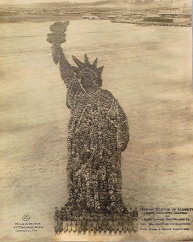 Departed back to USA 22 Nov 1945 and Arrived 30 Nov 1945. He passed away in 1958. My dad has told me a few stories about Roy, but I need to know more. If anyone has any info on him or his unit, please share your info with me. Hello, My Name Is Joe, Son Of Tony Konkol. I Drive Down I-94 And See The Marker For The 94th. My Dad Died At Age 52, He Was Part Of The 94th/ Medals Silver,Bronze,Purple- I Don't Know What They Were For. I Do Remember He Said That The Real Hero's, Never Came Home. I just returned from a 10-day trip to N. France, Western Germany, Luxembourg, and Belgium. The purpose of the trip was to retrace (to the best of my ability) my Dad's route across N. France from July - December, 1944 and into Bastogne. He was with the 22nd F.A., 4th Armored Division. While driving in Germany, on a side trip to find remnants of the West Wall, in the vicinity of Sinz (east) on the E-29, I came across the Peace Monument dedicated to the 94th Infantry Division. The pictures start at Camp Phillips in Salina, Kansas in 1943 and photos from Camp McCain in Mississippi and then to France (December 1944) , Germany and Czechoslovakia at the end of the war. The pictures are great as they range from training scenes to groups of men in Dress uniform, OD's and combat loads. Pete was in the HQ company of the 302nd. This is confirmed by letters to his wife and information on a jeep bumper in one picture from oversees. The following individuals are named in pictures in either the states or overseas: George Evans, John Perchan, Jack Heiney (Heaney?) Bob Dickson, CAPT Williams, and The following last names: Sidler, Ripper, Wagoner, Hockland, Evans, Dudkowski, Unshuld. If you know of any of these gentlemen or are one of these soldiers, there are some fine pictures you may wish to see. Plus, we're looking for anyone who knew Pete Alsko during the war years. Please email me. 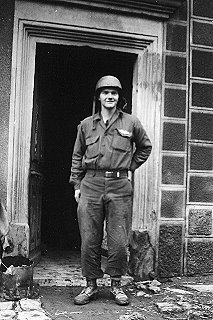 Thought you might like to see this photo of PFC Albert J. Hamel, 94th Division, from NH, ASN # 31435963, that I recently came across. Any information on his Service with the 94th would be greatly appreciated. My dad doesn’t have a computer or email, but he has a phone and would love to talk with families and fellows about his army / WWII experiences. He lives in Portland Oregon. Here’s his contact info. Give him a call! He’s the fellow who was looking for Capt Whitman’s book, which we subsequently found with your help. Thank you. My email address in my previous post about the book was incorrect; my correct email address is below. We have been trying to arrange for a “Sister-City” between Freeport (where we live) and Ile de Groix in Brittany. Our good Freeport Mayor, William Glacken, wrote, on July 2007, to the Mayor of Ile de Groix and he does not answer us. We also went to the French Consulate in New York City and spoke to the Deputy Consul, Mme. Chauvin. She also tried to help us from Paris. Nothing happened. At this point, it looks like to be, if not a dead issue, then a very improbable one. So, on May 15th, Pierre Poussin (my good friend and official interpreter for Etel) sent letters to the Mayors of Lorient and Etel and also Odette Helou (our 94th Infantry Division Mascot) also sent letters to Vannes. We spoke to Pierre last week and he said, because the new or original mayors are trying to start their new terms, nothing will happen. He also says that, maybe in December, we will ask my Mayor to send invitations in French to Etel and Lorient. We also spoke to Odette and she wants us to come as soon as we can. She will also telephone the Mayor in Vannes. We found some pictures from the 2004 trip when we were there for a Champagne Cocktail in Lorient Town Hall and a beautiful Luncheon in Etel (where the Gerow Hodges Exchanges took place and where the Germans surrendered in May 7, 1945) in the Bar Breton (a Historical Site). Maybe, we will ask my Mayor to send these pictures with these invitations to Lorient and Etel. We will ask Pierre too. If we cannot arrange for the above, then it appears that the September trip is out. Some people who wanted to go can’t go for other reasons, like illness. Maybe, we’ll do “The Last Hurrah” next year-maybe around June 6th. That’s 65 years when the invasion came and there will be great celebrations in France (and maybe the euro is lower and the dollar will be higher). What do you think? My cousin and I are looking for any information we can find on our Uncle SGT Willie Daulton Griffin Serial No. 38482037 Co. L., 94th Division, 301st Regiment killed Feb. 28, 1944 and buried in Luxomberg. He was an only living son with four sisters. We have photos of him in his uniform and all the letters he sent Mother while in the army. The only response concerning his death was that he died facing the enemy. He was awarded the purple heart which my Mother still has. We would like any information about the circumstances surrounding his death. We would especially like to find anyone still living who served with him. Anyone that is interested in a copy of a signed photo of the "A" battery 301st field artillery of the 94th division of whom my father was part of during WWII can contact me at mikeapt@hotmail.com also, I have a copy of a photo book that has pictures and comments of the fight through Grance and Germany with photos of each soldier in the Field Artillery battery. This battery defended the ship Queen Elizabeth, with the guns aboard since it went to Scotland unescorted and was involved in the historical 15,000 round artillery bombardment of the germans at the "battle of the bulge" when the 94th division smashed the Sigfreid switch line. No wonder my dad, deceased Army Lt. Colonel Donald G. Apt couldnt hear too well and thought the best defense was a good offense. Remember these men on this day for they blessed us with their sacrifice and effort. My name is James M. Osman Jr. At the urging of Capt. Douglas LaRue Smith I forwarded copies of a DVD I produced regarding my father (deceased), James M. Osman, Co. M, 2nd Pltn. He was captured during the battle at Nennig, Germany on January 20, 1945, sent to Stalag XIIA then to Stalag IXB, Bad Orb, Germany until liberated on April 2, 1945. My reason for contacting you is because I just found a website advertising a movie about that specific battle and the 94th Inf. Div. It is to be released this summer of 2008. I thought you might like to pass along this information to all the remaining 94th Veterans. As the seasoned infantry and tank units of the German 11th Panzer "Ghost" division move silently into position on the snow covered hills around Nennig Germany ,a battle weary GI and his unit stand ready to defend the small town, a key position in the Allied advance to win the war. Outgunned and outnumbered, S/ Sgt Don Smith (Cole Carson) struggles to find hope and courage against overwhelming odds in one of the decisive confrontations in the "Battle of the Bulge" during WWII. His squad of GI's of the 94th Infantry Division lay dug in on the ridge-line outside of town. No one in high command believed that German forces would attack in the sub zero temperatures and near blizzard conditions. As the pre-dawn attack comes, with communications down Sgt. Smith is left with no choice but to make his way through enemy fire, unarmed and wounded, into town and warn of the coming attack. Based on actual accounts "Everyman's War" explores the heroic events of this decorated veterans courage and the struggle between duty and desire. Between the prospect of the life and love, Dorine (Lauren Bair) that waits at home and the harsh realities of war which marks the pivotal epoch in his life as he discovers that the loss of hope can be worse than the loss of life. One man's courage...One man's hope...Everyman's War. An ensemble cast including Mike Prosser, Sean McGrath, Erik Reid and Brian Julian bring the authenticity of this company of Gi's in war ravaged Germany to life. I am writing you to find out if you would be able to help me in obtaining information about my father unit, where it was during WW11.My fathers name was Virgil E McIntosh serial # 32 585 404 from Corning ,N.Y. He served in the 94th Div.in the Anti Tank Co. 302 Infantry as a gun crewman. He joined in Dec.1942 and was discharged in Dec. 1945.If you could provide information or links to places I could find information as to where he traveled and what front he fought in would be appreciated. Hello. I was talking to a regular customer in my restaurant a few weeks ago when my trip to Europe this summer came up. I'm touring through 6 countries to follow the path of the 101st airborne but when I found out that her uncle was KIA in France I offered to make a detour to Brittany to take a picture of his grave site since no one in their family has ever been able to see it. I have been researching Pvt. James W. Alex from the 376th infantry regiment but I can not seem to find any information about his unit other than where the division was during the end of September when he was killed. I don't know if this information is still available, but can you tell me where the 376th infantry regiment was during the last 2 weeks of September '44 and where their regimental aid station was set up? I plan on presenting the pictures of the grave site, the location of his death and his unit patches to his nieces when I get back from Europe. "Memoirs of a Rifle Company Commander"
My dad, Arthur Arnold Kuehmichel served under Lt. Col. Whitman and was given a copy of this book a number of years ago. He lent it out to many other WWII vets to read. The last man he lent it to did not understand its significance to my dad and lost it. My dad seems unable to let go of the fact that his treasured book is gone. Is there ANYWAY possible to get another copy? It would mean the world to my father. Please help me!! Thank you kindly. Yesterday, Junie and I went to New York City to see the French Deputy Consul, Mme. Chantal Chauvin and her aide, Mme. Helene Vasquez. They are always very courteous and warm. We spoke to them about our visit in Washington and the French President Nicholas Sarkozy that gave me the Medal of Honor. That was an HONOR! We wanted to speak to Deputy Chauvin about two things- one: the idea of making sister-cities between Freeport, where we live, and, in Ile de Groix in France—and, two: making a French trip with our veterans, relatives and friends in September 2008. I had spoken to my Mayor William Glacken, who sent a letter to the Mayor of Ile de Groix, Dr.Eric Regenermel, saying our cities may be interested in entering a “sister-city” arrangement with his community. That letter was sent on July 19, 2007. His office did get it, but the doctor never responded. We had waited for the elections in March because my good friend, Pierre Poussin said, after the elections, maybe, he will answer us. Nothing happened. Mme. Chauvin will speak to someone in France who could help us, and maybe to the French Mayor. If they do not do anything, we will try for other Brittany cities like Lorient (we visited there in (2001 and in 2004, their mayor made us a beautiful champagne reception). We also visited Etel (Café Breton where Gerow Hodges and the Germans made the exchanges). We could also try for Belz or Vannes. There are other things that happened there in Brittany when we were there! As far as our trip to France -we have to talk about that. A few months ago, when we first started thinking about it, a few people said they would be interested in going. With the falling dollar, it now would be extremely expensive to go. Would you still want to make the trip? We feel that if we have enough people, we could get a bus from the Paris airport to Ile de Groix, Lorient and in around Brittany and then, back to Paris. I don’t think it would be wise to go any other way, carrying luggage, etc. We are all getting to an age where we have to make it as easy as possible for ourselves! We would only go for about 11 days, but, other people (like Lorraine or Valery and Morris) will stay after that if they want. Maybe, Thursday, September 18th to Sunday, September 28th would be OK. If you want to change the days, we’ll talk. If you are interested in going, please let us know. We will wait up to May 10th for your answers. My friend and dear, trusted friend, Joan Behl (who is a Travel Agent) will do the land, and, if you want her to do the Air, she will help us too. I did send these e-mails and letters and bulletins about the “The Last Hurrah” on October 2007, but the trip would be about the same itinerary for September 2008. My name is Paige Godat and I am trying to find out info on my grandfather. He was in the 94th infantry and was at Camp McCain in Mississippi. He died a few years ago and I am trying to get more details about his time during the war. I was able to get some info in interviews I did with him. I found somethings in his attic, a 94th infantry patch and a 16 Armored division patch. He won a bronze star and 2 french medals. The National Archives was unable to help me because all his records burned up in some fire in St.Louis. I just don't know where to go next. Any help or direction would be very appreciated. His Name was Homer Leander Prewitt. He was a staff sergeant and in field artillery. When he left in August of 44 he was in the 356th but his discharge papers say 395th. My grandmother said he was moved from his outfit sometime in France once he had been over there awhile. My name is Bill Lord and my Dad was David A. Lord who passed away Sept 9th, 1981. When we were clearing stuff out of the house we noticed a newspaper clipping about my Dad earning the Silver Star for actions in Germany WWII. I know he was a member of the NY National Guard in Troy NY and we have pictures of him wearing the 9/4 inf patch. What my brother and I would like is more information on my Dad, his deployments, battles he was in, and we were hoping you might be able to point us in the right direction. Subject: Edward William Hemmerlein, 94th Division, 376th L Co. I would like to hear from any soldier who served with my late cousin, Edward William Hemmerlein, 94th Division, 376th, Co. L. Edward was born in Dubois, Dubois county, Indiana and was 19 at the time of his death. Edward's father, Edward C., Hemmerlein and my mother, Frieda were brother/sister. Edward was my first cousin. Edward was trained at Camp Wolters, Texas, and Camp McCain, Miss. He served in France before being sent to the German front. He was in Gen. Patton's Third Army. Details sent to his parents indicate he died near the Bannholz Woods, west of Sinz, Germany on Feb. 20, 1945. (see www.94thinfdiv.com/94th376stCasualtyH-K.html) He had been hit by shrapnel which severed an artery in his upper right thigh. He was treated by an "aid man" - and a tourniquet was placed on his leg. However stories told to the family indicate that before medics returned with prisoners who would carry the wounded to an aid station, Edward got to moving around, dislodging the tourniquet and causing him to bleed to death. In 1947, the family received a letter from Claude V. Hetrick, a fellow soldier who re-counted the details leading up to Edward's death. I am curious if Mr. Hetrick is still alive? My Father-in-law served in the 94 infantry 319th. He is 88 years old now and has become very forgetful. He is basically driving everbody crazy now because he believes we lost a professionally made documentary on VHS tape format on the 94th Infantry Division. Is there any such tape available today? If so, any help you can provide in locating this video would be greatly appreciated even if it were just a copy. My Grandfather, Ernest Pope was in the 94th. I never talked to anyone about the war. He passed away several years ago. I am trying to find out information about his military career. I have a shadowbox of his medals and would like to know how he received them. How can I find out more information about his military service record? My email address is jpope@bbschool.org . My name is Eric Meyer, my father John Meyer was a member of the 94th 301st 1st Bat f company. I am interested in learning as much as possible about when and where he was during WWII and any documentation available as to him by name. perhaps in reports for example. He has always been reluctant to speak of his experiences and has just started to talk of them in the last 8-10 years. Feb 2009 will mark his 85Th birthday and we (His children) are putting together a sort of chronicle of his life but are lost as to where to gain info on his war years. If you can help I would be forever in your debt. 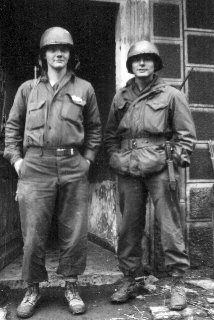 I allow myself to appeal to you about two GI's that my aunt had known in 1944 in chateaubriand(44 Loire-inférieure): Chester Avery and Richard Van Hoken of the 94eme Infantry Division. They left in November 1944 fight in germany, there have been a few letters and then resumed normal life after the war, which is fortunate. My aunt was 80 years since a few days and she told me several times of its "GI's". I writing about my uncle who has past away back in10/19/1983. I'm sorry for writing so late but I did not know who he was with in WWII. He has stated that he was with the 94th. Can you possibly tell me more? I would like to find pictures of him? Nicholas G. Fast Horse was born on April 16, 1924.1 He was military active duty after 1942; PFC in the U.S. Army. He died on October 19, 1983 at age 59. He was buried on October 24, 1983 at Black Hills National Cemetery, Sturgis, Meade Co., South Dakota, USA; Grave site: A 698. My grandfather, Marion Wiseman, was in the 94th during the rhineland and central europe battles. He didn't talk about the war much, but I do know he was a machine gunner. He said his asst. gunner was a indian named White Hawk who was from oklahoma. My grandfather passed away last year, so any information or stories of anyone who knew him or his buddy White Hawk would be appreciated. For the past couple of months I have been sending out letters to company members who supposedly served in WWII with my father, Charles Everett Weeks. The only information I have on my father and his service during WWII is information from his honorable discharge paper. Information from the discharge paper says that he served in Co "K" 302D Infantry. It also says that he was a First Sergeant and served in Rhineland and Central Europe. He was inducted into the service on October 30, 1942 and separated in February 7, 1946. Reason and Authority for Separation: AR 615-365 CONVN OF GOVT RR1-1 (Demobilization). If anyone reading this remembers my father, OR has any suggestions of where else I might search to find out information on him, please contact me at the following email address: click HERE to email me. Or you may write to me at the following address: Mrs. Donna Duty, 110 Angora Court, Cary, North Carolina 27513. My name is William Maynard. I have authored a book about the 66th Division relieving the 94th Division in Northern France in Dec./Jan. 1945. The message below was never posted on the 94th Web page. I would be most grateful if it could be put up, along with the attached picture. Many thanks. My brother, Albert Glazier, died on November 13, 2004. To mark the second anniversary of his passing, I am adding on this Veteran’s Day a supplement to the brief death notice appearing in TAPS at the time my siblings and I were mourning the loss of our eldest brother. Al grew up in Indianapolis and attended Purdue University for three years. Close to his degree in civil engineering, he quit school after our brother Bob was wounded in Italy. Shortly thereafter, he joined the army. He underwent basic training in Mississippi and landed with the 94th Division over Utah Beach in September, 1944. Assigned to Company B of the 319th Engineer Battalion, Al went through all the bitter campaigns of the 94th Division. He never went to division reunions for reasons I could not fully understand, although toward the end of his life he had hoped to attend a 94th gathering in Tennessee. That hope coincided with a new willingness to talk about some aspects of the war. Much remained that he didn’t discuss. A year before his death, I recorded his narrative of the move out of Campholz Woods to the Saar River crossing. He had a remarkable memory for the names of men with whom he soldiered, and one fortunate consequence of our recording is that he got back in touch with one of his closest friends, Chet Slepski, now living in California. I thank Rose Welton, who kindly provided the contact information. Besides Chet, Al spoke of Bob Bennett, John Fredel, Ev Gehrt, Ernie Miller, Bill Goldberg, John Schreier, and Bob Bailey. Perhaps the families of those men will read this notice and know that their memories are here inscribed. After the crossing, Al was written up for the Silver Star for his action in constructing a tread way bridge over the boats that he and other engineers had lashed together across the swiftly moving current of the Saar. Shortly before hostilities ended, Al was wounded near Krefeld, Germany. I am very intersting in reading and studying history in my region and I rediscovered several old battlefilelds (Kampholz, Orscholz, Besch, Nennig, Butzdorf, Tettingen, Wochern on the german riverside , the so called Orscholzriegel, with the help of maps and detailed descriptions for example of your members of the 94th infantery division. I am very surprised to find in the woods these destructed blockhouses (BUNKERS) and many paths relining them each other. I try to document these historical facts, battles and personal stories. 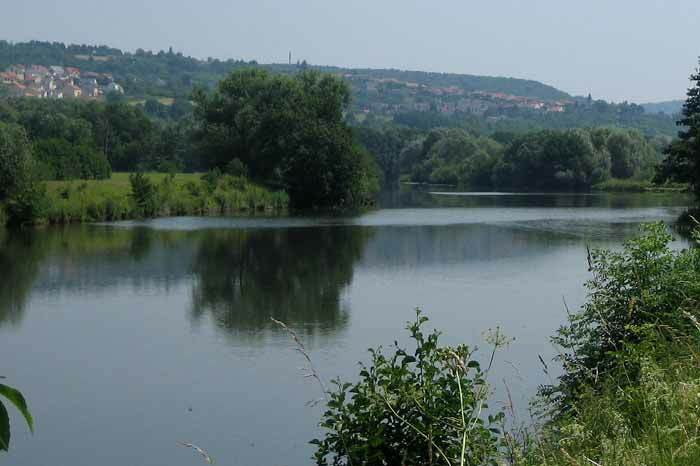 I would appreciate to find other documents, photos, maps or reports about the historical facts in this region including especiallyalso REMICH and its surroundings on the luxembourgish riverside. Unfortunately all habitants living in my village vere evacuated in other regions during 2nd world war and nobody knows exactly what happened in this village during the german occupation. Maybe you know historical sources or links to find out. Thank you for your attention and please know that we are keeping deep respect for all these brave deeds of your friends of ther 94th infantry division. Please feel free to call and talk anytime!!! My dad William Murphy died on April 2, 2007, my mom is looking for an address for Tony Digara in Colorado who was also in the 94th Division....can any help? I attached some pictures I located in my father's files. No one in my family recognizes these men. I think I send these to you about a year ago. Please feel free to circulate these photos to anyone who might know these men. I assume they were in A301 as my father. My phone # is 317-523-6736 in the event someone would like to contact me regarding these photos or my father. My father is Pfc John N. Mandas and his WWII service records were lost in the 1950's fire. Decoration & Citations- "Purple Heart GO 410 Hq. 94th Inf Div 44 1st Oak Leaf Cluster to Purple Heart CO 6 Hq. 106th EM 45 European African Middle Eastern Service Medal"
Battles & Campaigns of- "Northern France GO 33 MD 45 Rhineland GO 40 MD 45"
Wounds Received in Action- "6 Nov 44 European African Middle Eastern Theater 25 Jan 45 European African Middle Eastern Theater"
If this information reminds anyone of incidents or battles they remember or if anyone remembers my father, please let me know. Also, please let me know if someone can suggest any organizations or web sites that would have information for the areas and times he was overseas. Having read the interesting story of the "Neuf, cats" as I was searching the web to dig out informations for my father in law Mr Raymond Jorre. This then 16 year old french soldier (he cheated on is ID card in order to enroll and fight for his country- by sctraching the 8 into a 6 on his birth date 1928) was assigned on October 1944 to the 5 VI/4 94 RI, subsequently on Jan 10th 1945 he was affected to the IV battalion /94 RI. During his service he was attached to the US 94, serving as guard on a German prisoner camp near Le Mans. I understand that the attached troop allowed the replace US soldiers who were then dispatched to the German front. His unit was then released from the US 94 , they were then assigned to French 2nd Division were he fought the battle of Royan. The web site has the following mention. If available would you be so kind to either forward me information on the subject or links that you believe could lead me to find such informations. I do realize that this tiny part might not be the preferred memory of the 94. But for my father in law it was a high-lite. This year our family will celebrate the 80th birthday of an honorable man. I would like to present him with as much informations as possible on this short period of his life. My Grandfather, Lawrence Wood of Oak Hill WV, served in the 94th during WWII. Looking for anyone who knew him or has any info on his unit. My name is Daniel Dunn I am the nephew of John J. Dunn who was in the 301st. He was KIA in Luxembourg in 1945, it say 2/21/45 on your web page and on the American Battle Monuments Commission it says 1/21/45 www.abmc.gov/search/detailwwnew.php not sure which one is correct but that is not the point of this letter. I am searching for any information your organization might have about my uncle or any men that served with my uncle. I started looking for information on my uncle back in high school and never found much, sadly my family doesn't know much about my uncle,other then he died in the war and is buried in Luxembourg. My father showed me a picture once of my uncle in uniform, that is the most any one has ever shared with me. My uncle did have one son, Joseph, who was born in September of 1944. Joe knows nothing of his father, or at least won't share any information with me. I guess I should give you a little information about me I am the youngest son of the youngest brother of John. My father is James, he was 14 when his brother died. My father was 50 when I was born, so I am much younger then all everyone in my family. Most people who knew my uncle where dead before I was born and once I learned about World War II in school and started to search for information on my uncle my father had Alzheimers for a few years and was already in a nursing home. So there other then my cousin Joe no one else in the family would have information. My mother remembers my father saying that Uncle John wasn't married and Joe was had out of wed lock and that might be a reason why know talks about Uncle John much. I never got to meet Joe's mother. My mother only met my father in the late seventies so she never knew much of my fathers family since they were all gone by the time she came around. I am getting married in a few week and meeting all of my future wifes family and seeing pictures going back to the turn of last century has re-sparked my interest in my own family. I am sad to say I really don't know much about my fathers family. I finally found out today what division my incle was in and when he died, before today all I knew was he died in the Battle of the Buldge. I know my father was born in Roselle Park NJ so I guess so was my Uncle I don't know if that information would help. Any information would be a great help.